Interspaces and free spaces have gained much public attention recently. This current discourse is reflected in the work of Austrian architects Henke Schreieck Architects, LAAC, and Sagmeister & Walsh. They interpret free space as both a spatial and a spiritual construct, as a complex dynamic system and versatile realm shaped by coexistence. Thoughts Form Matter features spatial installations these three firms have created for this year’s 16th International Architecture Exhibition of the Venice Biennial. They partly merge into each other, materialize and visualize concepts such as Deviation, Atmosphere, and Beauty. The book documents the projects with rich illustrative material and interviews with the architects exploring the underlying ideas and notions. 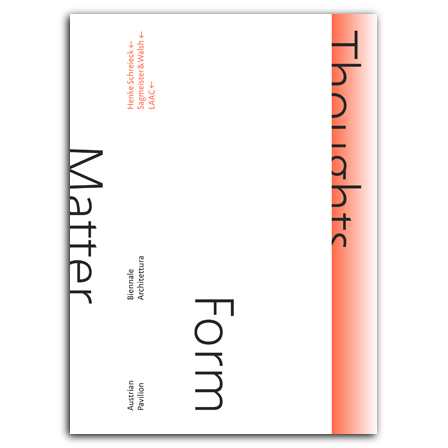 Rounded out by an introductory essay by Verna Konrad, Thoughts Form Matter is a plea for the power of architecture as intellectual investigation and for the freedom to create spaces which are uninhibited by functional and economic constraints.